Robert Falcon Scott was born in Devonport on 6 June 1868 at his family's home, Outlands. He became a naval officer, and subsequently led the British Antarctic Expedition of 1910–13 in search of the South Pole. The members of his team were Lawrence Oates, Henry Bowers, Edgar Evans and Edward Wilson. The team reached the pole in January 1912 only to learn that Norwegian Roald Amundsen and his team had beaten them to it, arriving there one month earlier in December 1911. On the journey home Scott and all his men perished. Devonport honours the memory of the British team with the beautiful Scott Memorial at Mount Wise Park. The memorial was unveiled on 10 August 1925 by the Commodore of the Royal Naval Barracks, C W R Royds, who had accompanied Scott on a previous expedition. It is now a Grade II listed structure, listed by English Heritage on 1 May 1975.. The memorial is 37 feet high, with figures representing 'Courage', supported by 'Devotion' and crowned by 'Immortality'. The ideas of 'Fear', 'Death' and 'Despair' are symbolically trampled under foot. The portraits of Scott and his team, Oates, Wilson, Bowers and Evans are contained within bronze medallions inserted around the memorial. A passage from Scott's final diary entry is laid out on the ground surrounding the memorial .... "Had we lived I should have had a tale to tell of the hardihood, endurance and courage of my companions which would have stirred the heart of every Englishman." The sculptor was Albert H Hodge , but he died before it was completed; his wish was for his brother and a Mr Doman to finish the work. Completion of the project was overseen by Sir Thomas Brock. Founders of the bronzes were Singers of Frome. The pedestal was the work of A & F. Manuelle. The ground on which the memorial stands was owned by the War Office, originally leased to Plymouth Town Hall in 1924 under a 999 year lease, but believed to have been given freehold to the city in the 1990s . 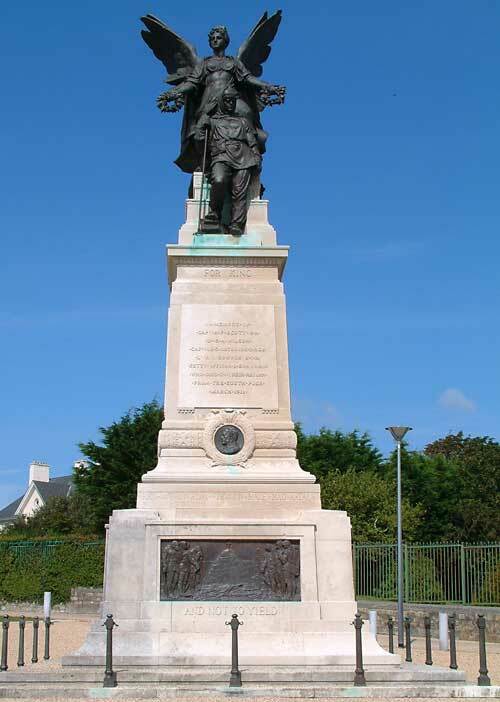 Robert Falcon Scott is one of Devonport's greatest sons. Mount Wise MoD land, upon which the memorial was constructed, was released by the Admiralty in the 1990s and upgraded into parkland by the city - Mount Wise swimming pools, the Redoubt and other parts of Mount Wise were upgraded at the same time.